We offer a comprehensive programme of activities for Second Level students. 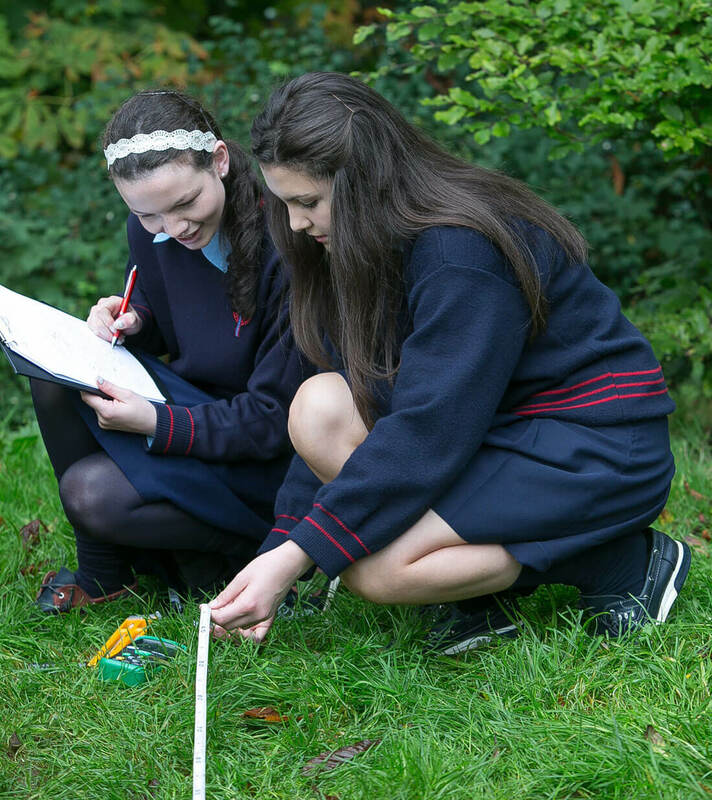 Running alongside our wide range of team-bonding adventure activities, we provide field studies, workshops and case-study days designed to reflect and complement themes across Geography, Science, Biology/Ecology, Maths/Numeracy, Business and LCVP. We also encourage schools to take on our exciting adventure activities. We specialise in team-building days with activities that encourage communication, trust, problem-solving and of course lots of fun! We cater for groups of all sizes (up to 200!). We need minimum 15 students to run one of our education-based activities and minimum 20+ participants for the adventure activities to open. Our upper limits depend on the activities chosen so please contact us to discuss. See our Secondary School Brochure. A habitat study of the diverse plant and animal life in our woodland ecosystem using a selection of sampling techniques and methods. The Footprints in Coal interactive multimedia exhibition is also experienced during the Ecology Field Study Day. Here students will see the processes that have shaped the Earth through time and discover more about prehistoric flora and fauna and see amphibian fossils in our fossil room. Groups can choose to do some of our adventure activities also to make the most of the day (additional cost). 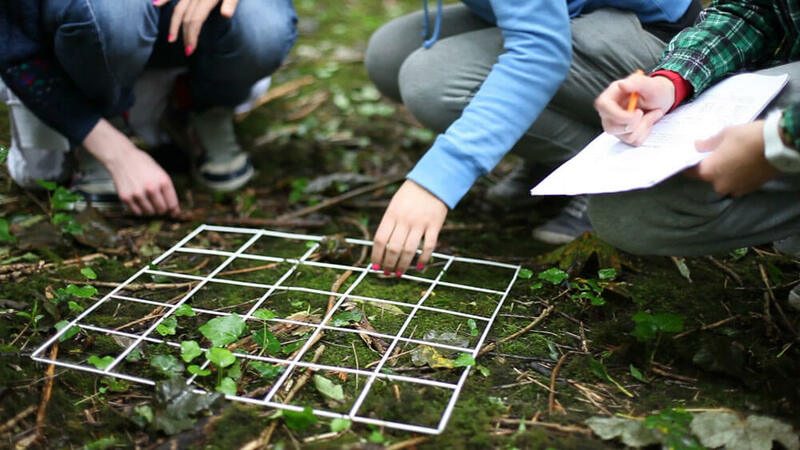 Students will investigate a study site examining organisms including woodland invertebrates and general flora and fauna. A range of techniques and equipment are used (e.g. square and point quadrats, line transect, light-intensity meters, classification keys, sweep nets, pooters and Cryptozoic traps) to observe, examine and record data collected. The physical and behavioural adaptations of the ecosystem will be explored to aid understanding along with briefly considering the impact of invasive species. An ecology work booklet is provided for each student to record observations and notes to take back to the classroom for further analysis. Students will investigate a study site examining organisms including woodland invertebrates, small mammals and general flora and fauna. A range of sampling techniques and equipment are used (e.g. square and point quadrats, line transect, pooter, mammal trap, classification keys etc.). The physical and behavioural adaptations of the ecosystem will be explored along with the effect of biotic (living) and abiotic (non-living) factors on plant growth along with briefly considering the impact of invasive species. A variety of environmental factors will be recorded (light, temperature, relative humidity, soil pH, slope angle) to aid further analysis and understanding. An ecology work booklet is provided for each student to record observations and notes to take back to the classroom for further analysis. Students learn about the development, organisational structure, employment and management of Castlecomer Discovery Park as a Social-Community Enterprise. This is achieved with three components to the day – an interactive context-setting lecture, a guided ‘walk and talk’ through the Park and by experiencing the coal-mining museum, the seed idea for the enterprise development in the early days. Price: €10 pp (€8pp without coal-mining museum). Can add on adventure activities also. Our interactive multimedia exhibition charts the formation of coal through various environmental conditions over 300 million years ago. 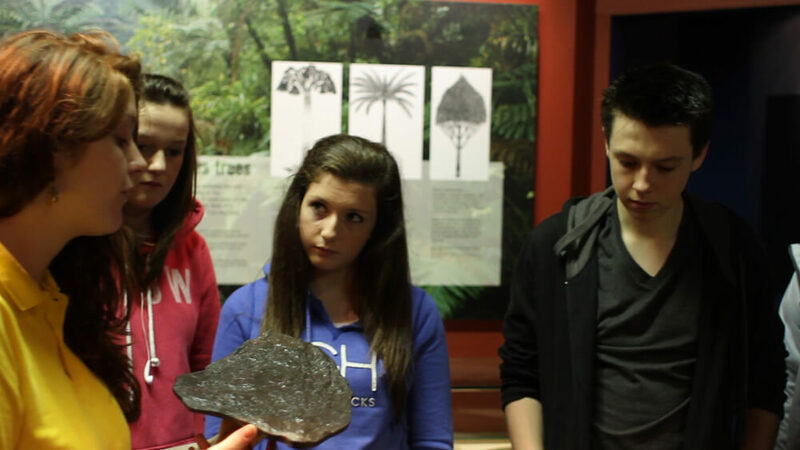 Students will see the processes that have shaped the Earth through time and discover geology, prehistoric flora and fauna and see amphibian fossils in our fossil room. Students will also hear about the Wandesforde Estate and related historical and industrial heritage. You can even crawl through our mini-mining tunnel to experience the working conditions and methods of a coal miner. Skills Used: Observation, Listening, Interpretation, Communication. This activity introduces students to basic map reading skills such as symbols, direction, topography and scale. A variety of maps (e.g. tourist, activity, OS) will be shown to highlight the uses of maps, to identify different natural and man-made features in the environment and to encourage a sense of place. Students are then tasked with creating their own creative visual representation of a map as part of a small team using materials found in the woodland. Once the map has been created, students will then explore and interpret each other’s maps before introducing and presenting their representations to their classmates in a short ‘show and tell’ exercise. 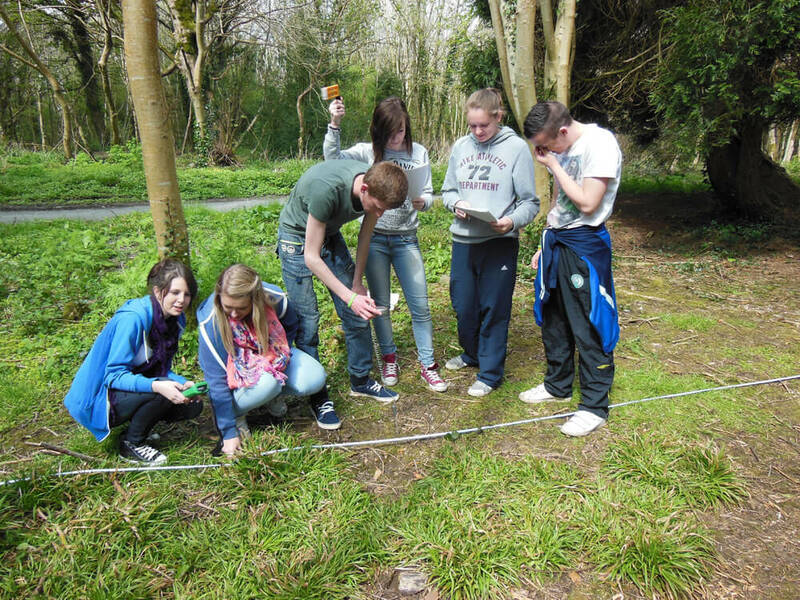 A hands-on, practical Woodland Maths & Numeracy Trail suitable for 2nd level, Junior Cycle students. Informal mathematics education is increasingly recognised as a valuable addition to improving mathematics education in schools (Shoaf et al., 2004). 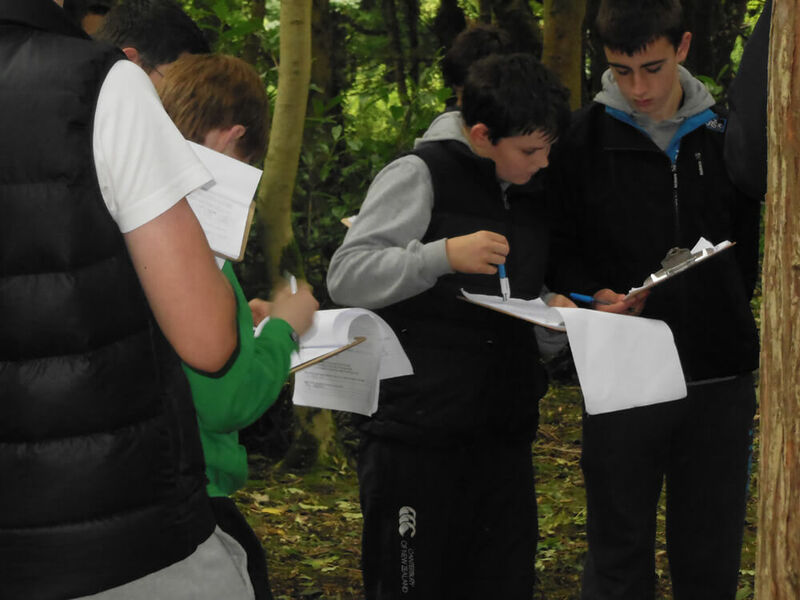 Set in the outdoor space of our 80-acre woodland, this activity aims to engage, motivate and enhance mathematical thinking, numeracy skills and capacities through experiential learning.The trail supports new learning approaches being implemented by second level teachers and offers access to the real-life context required for successful Project Maths learning. The trail contains a series of student-led challenges across a variety of topics (see curriculum areas below) and students are tasked with completing a number of challenges depending on year group. Students & teachers are encouraged to follow up on their visit to us by devising new challenges to add to the Trail. The mathematical problems have been devised with input from Senior Maths teachers Carl Lynch (St. Kieran’s College, Kilkenny), Paul Behan (Castlecomer Community School), Jim Marsden and others. We thank them for their support. The research and development of the Woodland Maths Trail was part-funded by the ESB Energy for Generations Fund. Numeracy, Observation, Counting, Estimation, Measuring, Comparing, Recording, Connecting, Problem-solving, Reasoning, Implementing. 90 minutes (to complete a series of challenges). Allow additional time if combining with an activity. Woodland Maths Trail alone: €8 per student. Other Activity Combinations available on request. We can combine any education and/or adventure activities to tailor-make the perfect package for your visit. We have no upper limit on groups sizes! To book please contact our Education Officer, Nichola: educationofficer@discoverypark.ie or call 056 4440707.